Extraordinary (and extraordinarily large) artisan live edge sculptural root wood sofa handcrafted from naturally free-formed burl redwood which has been polished and worked into an impressive sofa created by California sculptor Daryl Stokes in the 1970s. 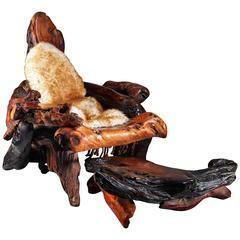 The twisted pieces of found live edge burl wood have been assembled to create this organically shaped piece. The root wood sofa has a knotted cord sling which assists the support of a seat cushion which is upholstered in a navy cotton mix fabric with Navajo style pattern. The back cushion is also in this same fabric which compliments the rustic style of this piece. 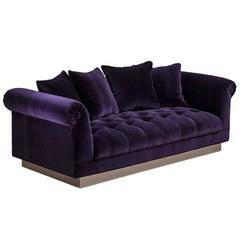 This impressive throne-like couch would be a great addition as part of a classic, contemporary or Mid-Century Modern living room, den, man (or woman!) cave, family room, office, bedroom, sunroom or conservatory. It would also be an apt choice in a corporate, retail or hospitality location such as a boutique hotel lobby, cocktail bar, members club, workspace studio, executive office or in a luxe clothing emporium. Excellent original vintage condition with only very minor signs of use commensurate with age. Excellent original condition with only very minimal wear. Contact us with any questions or more information on condition.